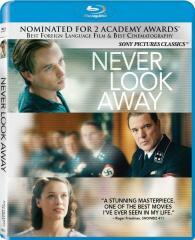 Inspired by real events and spanning three eras of German history, NEVER LOOK AWAY tells the story of young art student, Kurt (Tom Schilling), who falls in love with classmate, Ellie (Paula Beer). Ellie's father and famous doctor, Professor Seeband (Sebastian Koch), is dismayed at his daughter's choice of boyfriend, and vows to destroy the relationship. What neither Kurt nor Ellie know is that their lives are already connected through a terrible crime Seeband committed decades ago.